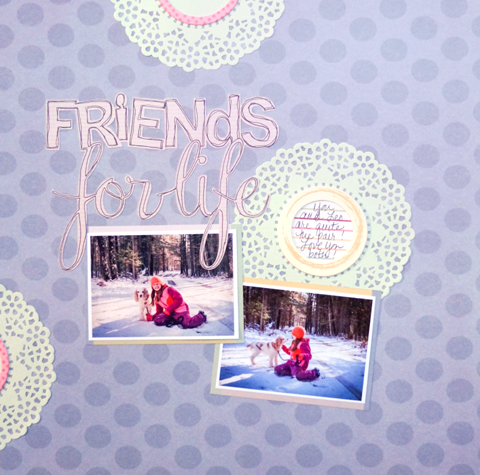 I had taken some cute pictures of my daughter and her dog on a walk the other day and wanted to share them on a layout but not necessarily use winter themed papers. I ended up pulling some paper from the Furry Friends collection by SEI and then used some of the green paper doilies they put out just for fun. 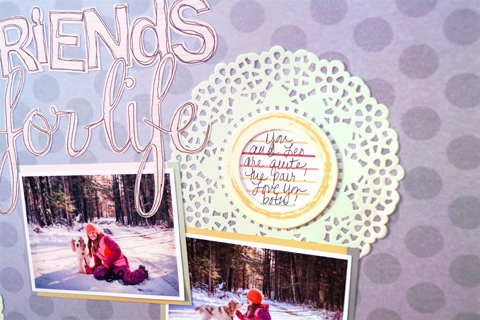 For my title I used my die-cutting machine (so easy to pull that out sometimes!) and matted my two photos using the punch apart photo mattes (or journaling cards) included in the Furry Friends collection. They were the perfect size for my wallet sized photos! You can see I also used some of the chipboard circles from this collection as well.